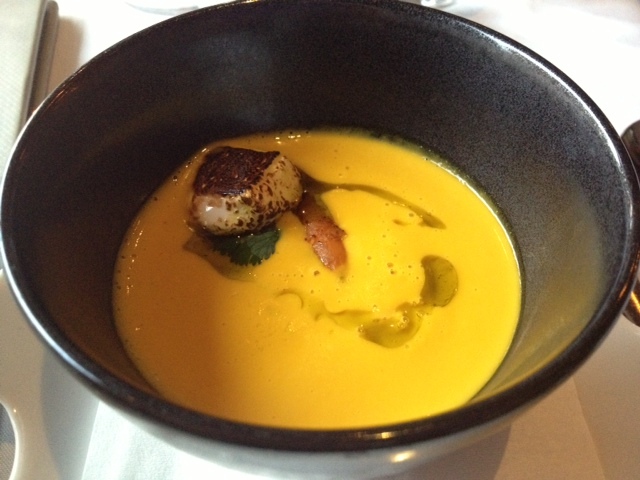 My favorite Philadelphia restaurant, Sbraga, is currently serving the ultimate autumn soup – carrot ginger. The ginger provides a kick that is balanced by the sweetness of the carrot. A perfect spoonful will include a piece of the charred marshmallow slowly melting into the velvety gold puree. You will also notice an occasional surprise hidden in the rich, creamy soup – chopped pistachios. This first course is sure to stimulate the palate for the courses to follow. This entry was posted in Uncategorized and tagged Autumn, Cooking, Fall, Food, Philadelphia, Sbraga, Soup. Bookmark the permalink.